Organocatalysis and especially its asymmetric version have emerged as one of the most powerful tools in organic chemistry. Organocatalysts consist of low- molecular-weight organic compounds, containing predominantly carbon, hydrogen, oxygen, nitrogen, sulfur and phosphorus. The major benefits of using organocatalysts instead of classical metal-containing catalysts are that they are, usually, moisture- and oxygen-stable, inexpensive, easily available and non- toxic. The importance of this research area during the last years is demonstrated by the existence of numerous special issues on this topic in various journals. As it occurs with all relevant research fields, the publication of negative and/or unexpected results accumulated in the expanding area of Organocatalysis should provide a very useful platform for scientific discussion and further development in the area. Thus, The All Results Journals: Chem will devote a special issue to this field to be published in the first half of 2012. Contributions may include results derived from any type of organocatalysis: Lewis acids and bases, Brønsted acids and bases, Mono- and multi-functional organocatalysts, Assymmetric Catalysis, Enzymatic Transformations, Peptide-based Catalysts, Polymer-supported Organic Catalysts, asymmetric PTC (chiral phase-transfer catalysts). To ensure timely publication of the special issue, a deadline of June 30th, 2012 for receipt of manuscripts will be imposed. However, early submissions are strongly encouraged in order to facilitate the evaluation process. Submitted manuscripts should not have been published previously. All manuscripts will be refereed through a standard peer-review process, and they will be published online immediately following approval for publication. All contributions should clearly indicate that they are submitted as part of this forthcoming special issue and must be submitted in our template (found in our website). Invited contributions will be subject to the same review process and criteria for acceptance as unsolicited contributions. For planned papers, a title and short abstract may be also sent to the Editorial Office for announcement on the journal’s website. Prof. Nitin Patil, Indian Institute of Chemical Technology (India). 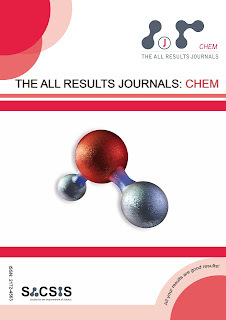 The All Results Journals:Chem is a peer-reviewed journal dedicated to publishing articles with negative results and outcomes that were not expected and were not before considered for publication in all areas of Chemistry (pure and applied). We believe that these results derived from experiments based on the application of the scientific methodology are crucial for the complete development of Science. Indeed, these results have been proven to be the preliminary path for major discoveries, which have been further published in other well-recognized journals. Undoubtedly, even those “negative” results, if the experiments were conducted under the well-established rules of the scientific method, should be also repeatable by any person in any place. All manuscript should also include a well-detailed experimental section, as well as a discussion section, in which a reasonable explanation concerning the reasons why such results have appeared is given. The Journal is TOTAL Open Access (no fees to publish and read) and is being indexed by well-known scientific databases such as Web of Knowledge, Scirus, CAS and Scholar. This assure maximum exposure of your articles. Please check our info for authors to submit your articles.